Uluru (Ayers Rock), Uluru-Kata Tjuta National Park, Northern Territory, Central Australia. Explore the heart of Australia without camping or getting a second mortgage with our comfortable travellers’ affordable guide to the Red Centre. Outback travel isn’t all about rust-coloured dirt, long driving days and energy-sapping heat – and it’s not as expensive as you’d think. Follow our comfortable travellers’ affordable guide to the Red Centre and start planning your visit to the heart of Australia. When you think of the outback, our famous red rock is usually the first thing that comes to mind. But just because you saw it on a school excursion doesn’t mean you know Uluru. First things first, times they are a changin’ in the Red Centre and as of October 26, 2019, you’ll no longer be able to scale Uluru. 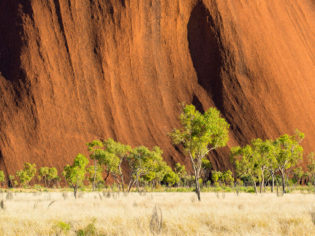 That’s right, the 348-metre-high monolith will be off limits, finally, to respect the spiritual connection the Anangu Aboriginal people have with this iconic landmark. But tourists will still be able to visit, take those gorgeous sunset shots we see plastered on Instagram and enjoy a tour or two around the base. One of our favourite Uluru experiences is hopping atop a camel for a sunrise plod. It will set you back about $80 but is a whole lot cheaper than a heli flight. If a camel ride is too much of a stretch on the purse strings and you still want to meet a dromedary, pop along to Uluru Camel Tours’ farm, home of the annual Uluru Camel Cup in May. The farm is located at Ayers Rock Resort and entry is free. Speaking of free, there’s a great ranger-guided Mala Walk that runs daily along the base of Uluru. You’ll hear Aboriginal stories, see rock art and learn how the park is managed. The route is only 2 kilometres and is wheelchair accessible. There’s more to Uluru than the rock itself, though (get the low-down here). Take the celebrated art installation Field of Light Uluru, for example. Created by British artist Bruce Munro, the 50,000 coloured solar lights complement the natural beauty of the desert. The installation has proven so popular that it’s been extended to December 31, 2020; to see it, you’ll need a pass (from $42 per adult). If you’re staying at one of the Ayers Rock Resort properties, you can join a number of free activities, such as guided walks through the native gardens at Desert Gardens Hotel. You can take part in Aboriginal storytelling sessions, learn about local native bush foods and watch a cooking demonstration with indigenous ingredients. There’s no limit on how many of the activities you can do, and you don’t need to book. Bonus. You’d be remiss for heading to Uluru and not venturing beyond its ‘borders’ to Kata Tjuta, arguably just as stunning as the big red rock. Still often referred to by its old name, the Olgas, the collection of 36 rock domes are only a 30-minute drive from Ayers Rock Resort. You can explore this geological marvel by embarking on the 7.4-kilometre Valley of the Winds walk, but if that’s too strenuous or the sun is already staring down, you can do the first part of the track to Karu Lookout (2.2-kilometres return). Kata Tjuta is a sacred Anangu men’s site, so although you’re allowed to visit, you must stay on the designated tracks. Afterwards, stop by the Uluru-Kata Tjuta Cultural Centre, where you can learn about the Anangu culture, join local artists in a workshop, and browse traditional artwork at Maruku Gallery. Entry to the centre is free and there are gas barbecues, so you can enjoy a picnic lunch on the cheap. After being blown away by the Red Centre’s rock formations, it’s time to be impressed by its chasms. Kings Canyon is a highlight for people travelling between Uluru and Alice Springs. The 6-kilometre Rim Walk offers amazing views of red cliffs and across Watarrka National Park, while Kings Creek Hike is a much easier but still rewarding 2.6-kilometre option. The Amphitheatre, from Kalarranga lookout, Finke Gorge National Park, Northern Territory, Australia. To the east and closer to Alice Springs is Finke Gorge National Park, where, again, you’ll be mesmerised by the landscape and historical significance of the Northern Territory. Home to the Finke River, thought to be one of the oldest rivers in the world, as well as a valley of rare red cabbage palm dating back millions of years, and Aboriginal cultural sites, this national park is not to be missed. You’ll need a 4WD to access it, so if you’re not travelling in one, best to join a tour in Alice Springs. There are plenty to choose from here. Other Red Centre highlights around Alice Springs are the huge granite boulders called the Devils Marbles (Karlu Karlu), and the majestic MacDonnell Ranges, where you can swim at Ormiston Gorge. There, follow the five-minute Waterhole Walk (with wheelchair access) and 20-minute one-way Ghost Gum Lookout Walk. Sunset on the Devils Marbles, Wauchope, Northern Territory. For many, Alice Springs epitomises the outback and therefore no visit would be complete without calling into Bojangles Saloon & Restaurant for ribs or steak and a cold beer. It’s also worth dropping into the Todd Tavern, “the longest-standing hotel in town”, for a coldie. If you’re hankering for somewhere hip, head to Page 27 Café in Todd Mall. Time your visit for mid-July and you can join cameleers at one of the quirkiest events in Australia – the Alice Springs Camel Cup. It’s a hoot for the whole family and not only can you watch the pros race their favourite camels, but afterwards you can bite into a camel burger from one of the food vans. How’s that for a budget-friendly day out? If you’re travelling by road and heading north, make your last Red Centre stop historical Tennant Creek, where you can get a true taste of Australia’s gold-mining history, continue your Aboriginal education and learn about the NT’s cattle industry. Mining and gold fossicking tours are available, and you can discover local art at Nyinkka Nyunyu Art and Cultural Centre. What’s the saying again? Champagne taste on a shoestring budget? Just because splashing out on a luxury tented pavilion at Longitude 131 is out of the question, doesn’t mean you have to rough it – or miss out. Travellers searching for an affordable Uluru experience can stay at another Ayers Rock Resort property, such as Ayers Rock Campground, which has two-bedroom cabins and a swimming pool. Cabin prices start from $179 a night between October and March and if you’re travelling with children aged five and under, they’re free. There are also low-season specials to help you keep your budget in the black. When it’s time to count sheep in Alice, Lasseters Hotel Casino is the best option for comfortable travellers with dollar value on the mind. The hotel has four restaurants, four bars, a nightclub, day spa, pool and, of course, casino. Although rooms are 4.5-star, booking one won’t require a visit to your mortgage broker. Prices vary depending on the season but hover between $100-$150 per night in low season. When exploring the stunning geology of Kings Canyon, you’ll want to stay at Kings Canyon Resort to give yourself plenty of time to get to know Watarrka National Park. The resort has private and shared lodge-style rooms, with communal kitchens and bathrooms. There is also a pool, barbecues, and on-site restaurants and bars. Another affordable option is Kings Creek Station. It’s a working cattle and camel property, and at $25 per adult per night for a powered campsite, it’s a great option for travellers who’ve hired a motorhome. There are also small safari-style cabins designed for a bed and breakfast-style stay. So, the nitty gritty of a holiday to Australia’s outback is how to get there without enduring a mammoth and expensive (have you seen the cost of fuel lately?) road trip through the desert. If you think Uluru is too hard to reach, there are three little words you need to hear: Ayers Rock Airport. Take a flight (look for low-season deals) and then transfer to your hotel, dust-free and ready to explore this ancient landscape. Alice Springs is the major hub for Red Centre travellers, and, as such, it’s also not as difficult to reach as you might imagine. Forget tackling the Stuart Highway and fly instead; the city is around three hours from most of Australia’s capitals. Once you get to Uluru or Alice you have two options for getting around: hiring a vehicle or handing the driving over to a tour guide. Hire costs vary greatly, depending on the type of car (4WDs will be more expensive), the time you visit and your length of stay. You also need to factor in the cost of fuel in such remote locations. However, if you want the freedom of a self-drive trip consider hiring a motorhome. That way, your vehicle doubles as your accommodation and you’ll only need to pay cheap campsite fees each night. Apollo Motorhome Holidays and Britz have budget models. If you don’t want to hire a vehicle, you can join a tour. We recommend Intrepid Travel for the money-conscious traveller. Book Uluru now and save 10% on all Inspiring Journeys! Witnessing the rugged splendour of Australia’s Red Centre is a life-changing experience.